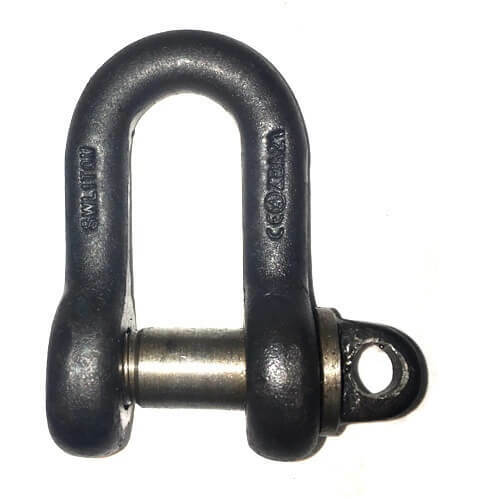 Small dee type shackles are ideal for temporary connections within lifting operations. 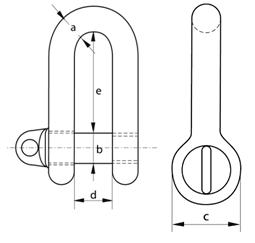 The British Standard screw pin small dee shackle is available in a range of sizes. Working load limits go up to 19 tonnes. A safety Bolted version is also available. These shackles consist of a high tensile steel eye and a type ‘A’ screw pin in a self coloured finish. We can also supply the same shackle with a hot dipped galvanized finish for extra protection. Finished to British standard BS3032 to ensure the quality and the MBL (minimum breaking load) is 5 times the WLL to ensure the safety of the shackle. All our shackles are dispatched with EC declarations of conformity for your convenience. Perfect for inline only loading they may not always be suitable for your task; however we also supply a wide range of bow shackles which can be used at angles. Here at Rope Services Direct we manufacture our own web slings and wire rope slings with your choice of fittings so you can buy all you need from one place to your exact specifications. Special assemblies can also be easily accommodated. Not sure of the size or type you require? Give us a call on 01384 78004 for friendly advice. Do you know exactly what you need? Use the contact us page to send us an email which will be responded to pretty quickly. British Standard Screw Pin Small Dee Shackle Overall rating: 5 out of 5 based on 6 reviews.